I’m captivated with these treat bags made from glassine sheets – it’s such a distinctive look! Left alone, they look old-fashioned, but when you run them through a TIEF they are right on trend. I used Stampin’ Write markers to color the image. I wouldn’t want to do 50 of them this way, but it’s enjoyable to do a few. The Rich Razzleberry ribbon from the Holiday Catalog is soft and has a lovely heft and it will stay in place. You could put this tag on a card, on a gift package, around a bottle or jar, or even tuck it into a lunch box or briefcase. To shop for the supplies, visit the Online Store. 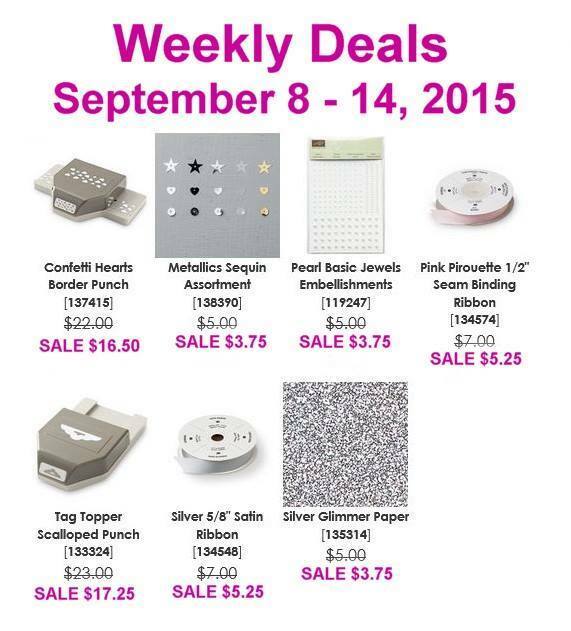 Ah…and here are the Weekly Deals for September 8 to 14th! Great idea to texture those bags! So cute!